Using seahorses as flagship species, we take a rigorous but pragmatic approach to conservation, turning our cutting-edge research into highly effective programs that address the most pressing issues of the day — from overfishing to habitat destruction to the illegal wildlife trade. Our innovative and nimble way of working has made us very successful, especially in light of our small size and limited resources. Project Seahorse has been recognized with the Whitley Award in Animal Conservation and Rolex Award for Enterprise, among many others. Learn more about our work, below. Our pioneering citizen science website and smartphone app allows anyone to contribute to the science and conservation of seahorses. As the recognized global authority seahorses and their relatives, we ensure that wild populations are healthy and well-managed. Collaborating with local communities, we establish marine protected areas where marine life can survive, recover, and thrive. We work with governments, industry, and small-scale fishers, and others to make fisheries more sustainable and to improve food security. We help to generate global trade protections under CITES and we work with governments to ensure their trade in marine life is sustainable. Project Seahorse trains conservationists from around the world to make a difference as scientists, policymakers and advocates. iSeahorse is Project Seahorse's citizen science website and smartphone app that allows anyone, anywhere in the world to contribute to seahorse science and conservation by sharing their wild seahorse sightings. 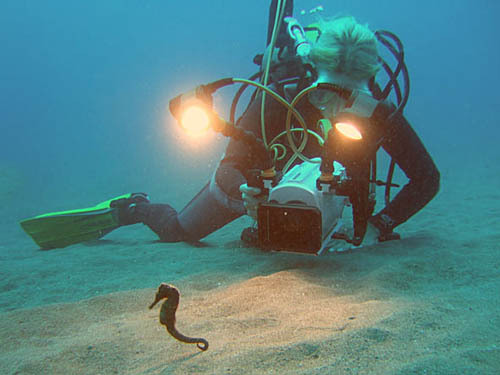 Whether you’re a diver, a fisher, a scientist, a seahorse enthusiast, or just on a beach holiday, you can upload your photos and observations to iSeahorse, help identify seahorse species, and advocate for their protection in your ocean neighbourhood. Scientists from Project Seahorse and seahorse experts around the world use this vital information to better understand seahorse behaviour, species ranges, and the threats seahorses face. We then use this knowledge to mobilize governments, policy makers, and ocean advocates to protect seahorses and their ocean ecosystems. As the recognized global authority on seahorses and their relatives, Project Seahorse ensures that wild populations are healthy and well-managed. We regularly assess the threat of extinction for these animals, work with governments to develop conservation action plans and management tools, help to regulate the global trade, and more. Built upon a strong foundation of scientific research and knowledge, our seahorse conservation program ties together many areas of our work, including the IUCN SSC Specialist Group on Seahorses, Pipefish and Seadragon, citizen science, sustainable fisheries, and trade and policy. Working with local communities and government, we have established 35 no-take MPAs in Danajon Bank, a rare and threatened double barrier coral reef system in the Philippines, with more in the works. These are sanctuaries where threatened marine animals such as seahorses and vital habitats such as coral reefs and seagrasses can survive and thrive in the absence of human pressures. MPAs also play an important role for food security, allowing community fishing grounds to recover from overfishing, destructive fishing practices, and other harmful activities. This same network of MPAs functions as a conservation laboratory for the world. Tracking the progress of the reserves since 1998, our team of researchers uses this constantly evolving dataset to formulate cutting-edge marine resource management tools for governments and conservationists across the globe. Nearly three billion people depend on the sea as a source of food and medicine, and 90% of all economic activity in our oceans takes place in coastal areas. Overfishing and harmful fishing practices such as trawling and the use of illegal fishing gear put tremendous pressure on fish populations, making their recovery increasingly difficult. We must adopt sustainable fishing practices to ensure food security for our generation and generations to come. Using biological and socioeconomic knowledge and integrating research efforts with marine management, Project Seahorse promotes sustainable fishing practices that balance their impact on both ecosystems and human coastal communities. 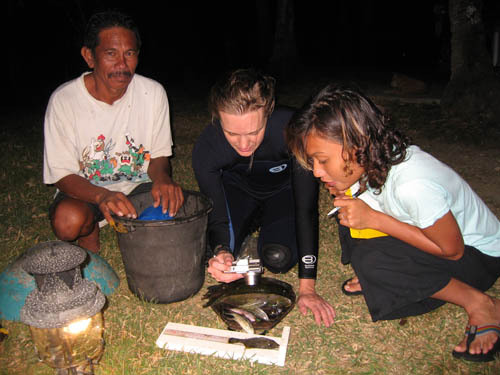 We develop management briefings and other tools to help governments to use their marine resources effectively and sustainably, and we work with small-scale fishers to protect fish populations and ecosystems and improve food security. Seahorses are valuable global commodities. Our pioneering research shows that they are overfished for use in traditional medicines, aquarium displays and as curiosities. Approximately 15-20 million seahorses are caught and traded around the world each year. While seahorse fishing is generally a legitimate practice — many subsistence fishers around the world depend on it for valuable income, and seahorses are used in some cultures to treat a range of conditions and ailments — such extraction must be kept at sustainable levels. Trawling poses a particular threat. Through a combination of research and policy recommendations, Project Seahorse works to make the global seahorse trade sustainable. We take an active role at many levels of the trade network, working with policymakers, resource managers, customs officials, traditional medicine practitioners, aquarists, and more to ensure that seahorse populations aren't overexploited. In 2002, we were instrumental in generating a landmark global agreement under CITES (the Convention on the International Trade in Endangered Species) that forbids countries from exporting more seahorses than wild populations can bear. This, the first-ever global agreement on trade in marine fishes of commercial importance, created a new international tool for fisheries management that has since benefited other threatened species such as sharks and rays. Since 1996, Project Seahorse has trained over 175 professional conservationists from around the world. Attracted by our interdisciplinary approach, our students come from backgrounds ranging from the biological sciences to law to the arts. In addition to the pioneering research and conservation work they do as part of the Project Seahorse team, our students and volunteers go on to build impressive, difference-making careers as scientists, policymakers, conservation advocates, and more.